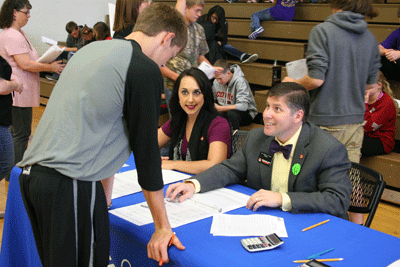 Providing 525 sophomores’ meaningful exposure to real world decision-making and financial realities, Communities in Schools recently hosted a pair of Reality U events. The event, which was coordinated by Cowley First, was held Tuesday, October 6 at Winfield High School and Wednesday, October 7 at Arkansas City High School. All sophomores from Winfield, Ark City, Central of Burden, Dexter, Cedar Vale, Argonia, Belle Plaine, Udall, Oxford, Caldwell and South Haven were invited to participate in the program. Reality U helps students understand some of the “realities” involved in preparing for an employable future and adulthood. This includes providing necessities for themselves, such as food, clothing, shelter, transportation, childcare, etc. Reality U provides students the opportunity to learn about choices that must be made as adults. Reality U provides a valuable service to teens helping them learn to determine spending priorities and how to budget their money. The goals of the program are to show teens that their performance in school today will affect their future, and give teens a chance to learn and practice personal finance skills in a fun way. Cowley College president Dr. Dennis Rittle, director for marketing Sarah Bryant, director of early childhood education Janet Davidson, and Career and Technical Education Department Chair Joe Clasen volunteered working booths that were set up for the students to purchase their goods/services. Dr. Rittle said Cowley College eagerly welcomes these types of partnerships with school and industry professionals, which in this instance, created opportunities to enlighten sophomore students from across Cowley and Sumner counties about the challenges associated with fiscal and civic personal responsibilities.